Thomas Johnson and Charles Spurgeon lived worlds apart. Johnson, an American slave, born into captivity and longing for freedom--- Spurgeon, an Englishman born into relative ease and comfort, but, longing too for a freedom of his own. Their respective journeys led to an unlikely meeting and an even more unlikely friendship, forged by fate and mutual love for the mission of Christ. Steal Away Home is a new kind of book based on historical research, which tells a previously untold story set in the 1800s of the relationship between an African-American missionary and one of the greatest preachers to ever live. Matt Carter serves as the Pastor of Preaching and Vision at the Austin Stone Community Church in Austin, Texas, which has grown from a core team of fifteen to more than eight-thousand attending each Sunday since he planted it in 2002. Matt has co-authored multiple books including a commentary on the Gospel of John in The Christ-Centered Exposition Commentary series and two group studies, Creation Unraveled and Creation Restored, which traced the gospel message through the book of Genesis. He holds an M.Div. from Southwestern Seminary and a Doctorate in Expositional Preaching from Southeastern Seminary. He and his wife Jennifer have been married for more than twenty years, and they have three children, John Daniel, Annie, and Samuel. Aaron Ivey is the Pastor of Worship at The Austin Stone Community Church in Austin, Texas, where he pastors a team of three hundred worship leaders, artists, storytellers, and musicians. Aaron has written and produced ten worship albums, and has written hundreds of congregational worship songs that are sung all over the world. His songwriting includes works represented in Worship Together, Jesus Culture, Capital Music Group, Doxology & Theology, and Austin Stone Worship. Passionate about mentoring and developing young leaders and world changers, Aaron spends much of his time communicating on topics of leadership, theology, art, and culture. He and his wife Jamie have been married for fifteen years, and have four children, Cayden, Amos, Deacon, and Story. "I loved this book and did not want it to end. I was unfamiliar with the story of the famous preacher Charles Spurgeon and the slave Thomas Johnson, and how our sovereign Lord brought them together in what can only be called a divine friendship. Now I am. I was greatly moved by this work and more than once brought to tears. Humans can be very evil, but our God is very good. This book is a wonderful witness to both of those truths." "I’ve long been a great fan of Charles Spurgeon. I wasn’t familiar with Thomas Johnson, and enjoyed reading about his part in the drama. As a fiction writer I appreciated the creative storytelling elements of this account. Matt Carter and Aaron Ivey have done a great job selecting historical realities and weaving them together into a compelling story. I really enjoyed Steal Away Home." "We live in a time and a culture when many people feel their stories are worth telling. It is certainly not for me to judge the worthiness of every story out there, even the one you hold in your hands. However, I will offer this—I cannot imagine having not been given the opportunity to know this story. Thomas Johnson, it creates for us an almost cinematic tale. Matt and Aaron have worked tirelessly to accurately and fairly capture the history in which this story is set. The evil of slavery and of those who perpetuated it. The indomitable spirit of the African-American people, acutely seen through the life of Johnson. The sacredness of true friendship, and the beauty of the gospel are all at the fore, and I cannot more strongly encourage you to read this powerful work." 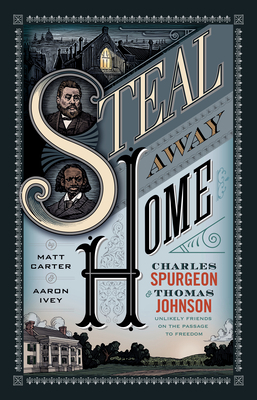 "Gripping and creatively presented, Steal Away Home explores the unexpected friendship between Charles Spurgeon and the Virginia slave-turned-missionary Thomas Johnson. It is a remarkable story of courage and redemption—one that captures the spirit of both brave men." "A fresh and artful treatment of two remarkable, gospel-shaped men. I’ve read lots of books on Charles Spurgeon. I’ve never read one like this one. Once you start it, you won’t put it down." "Steal Away Home is the collaborative work of a pastor who specializes in truth, and an artist who specializes in beauty. Their subjects are a titan of truth and beauty in his own right, the great "Prince of Preachers," Charles Hadden Spurgeon, and his lesser known yet no less significant friend, missionary and abolitionist Thomas Johnson. While claiming to write historical fiction versus pure biography, Matt and Aaron have done a great job honoring two men whose profound impact shares a common thread: neither outgrew his need for Jesus and the gospel. As a preacher and aspiring abolitionist myself, I am moved by this volume not only to be a better minister, but to remain thirsty for our freedom-fighting, truth-telling, and beautiful God." "We are all craving God-fearing, humble, bridge-building examples of faith and friendship. Charles and Thomas are just that. I found myself relating and yet craving more for my own life. Prepare to be moved and changed by these men's lives. The two men writing this book, Aaron and Matt, share a unique friendship on mission too, and I'm blessed to sit under their leadership weekly in our local church. They are humble seekers of God's glory, who desperately desire the same things today Charles and Thomas desired... men to be saved and know the love of God."